Precious little is known (to me) about then new Frederic Jouvenot watches. I would know a bit more if I was able to properly read French, and because all the press information is in a PDF… good luck trying to get me to put all that into the Google Translate tool. Good thing that a picture is worth a thousand words, because these images say a lot. The new watches will be released soon – in Basel if all goes according to plan. You can see that they are all based around the same theme and movement, but in these images there are at least two cosmetically different models. There is a distinct retro feeling from the watches. 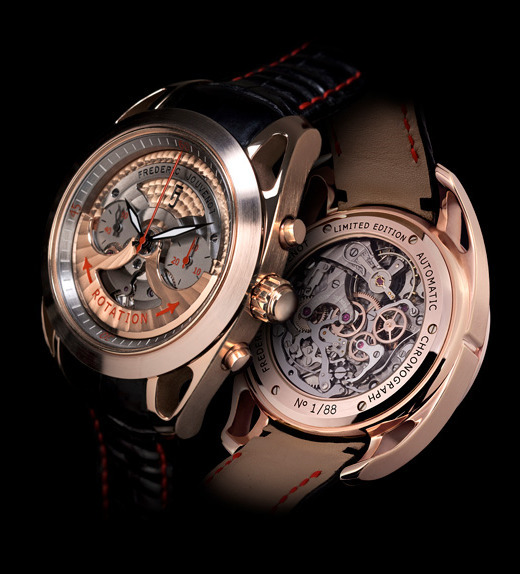 Watch maker Frederic Jouvenot is young at about 31 years old and wanted to create something new (as all young watch makers who branch-off from larger brand often do). 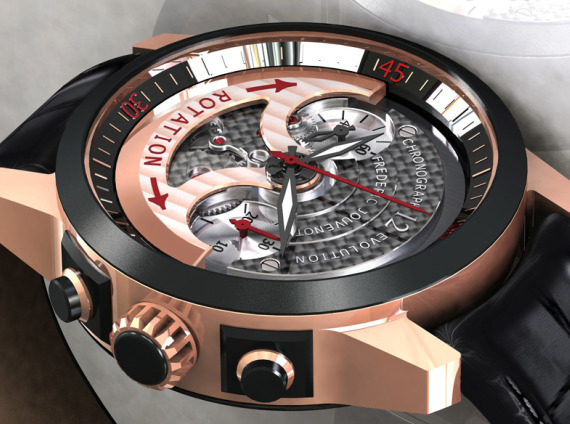 His new movement inverts the rotor of an automatic movement and places it on the front of the watch. From a mechanical level, the watch is nothing totally unique. A thirty minute chronograph in a bi-compax orientation makes for a n attractive dial as well as mechanical movement view in the back. The tough part of this watch was not placing the rotor in the front, it was doing so in a way that did not look silly. On that level the watch is pretty clever. I like how the rotor is carved away to give the chronograph counters an unobstructed view when the watch is in a vertical position. Further, the rotor is placed behind the main hands as to never obstruct them. Rich perlage polishing makes up the dial face which is available in different colors. The case itself is 18k rose rose, with at least one version featuring black gold accents (like the bezel). My favorite case is the one with the large skeletonized lugs, reminiscent of 1970’s watch designs with that modern twist. The lugs on the 44mm case have that integrated look and just match up well with all the polishing all over the case and dial. This watch is like two steps away from being a blingy watch, almost, but not quite. 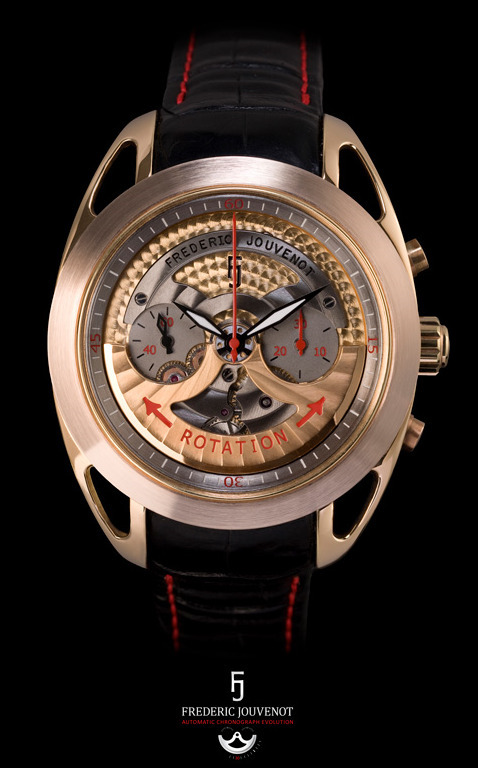 I can see how the wrong crowd will mistake the automatic movement rotor on the face of the watch for Frederic Jouvenot’s take on “wheel spinners” for watch. 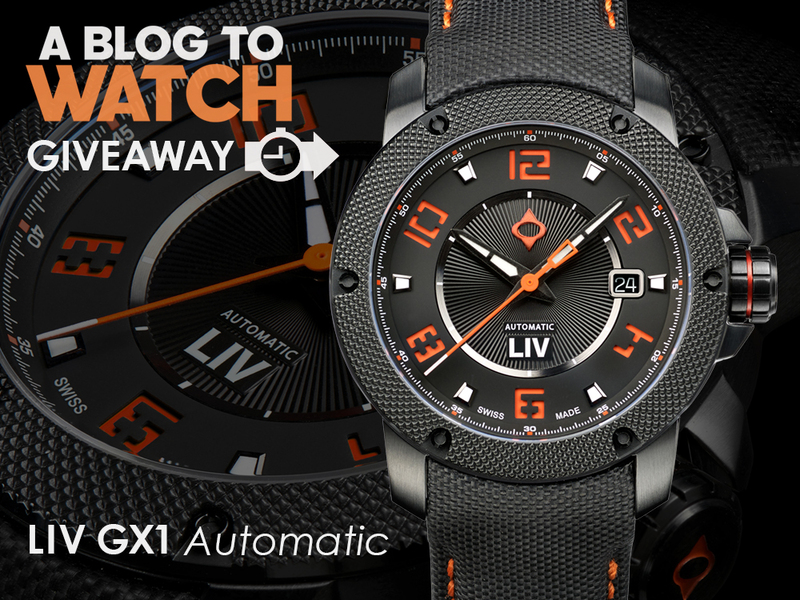 As for the name of the watch, it is pretty silly, “Automatic Chronograph Evolution.” Come on… really? Lets get with the time and give it a name that isn’t merely descriptive. “Yea, I know it is an automatic chronograph, but what is it called? !” Hopefully at launch there will be a new name as well. 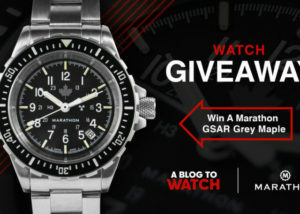 The focus of this watch is to resolve one of those watch enthusiast dilemmas. “I like the convenience of an automatic watch, but I also like looking at an unobstructed movement.” When you invest in an expensive mechanical watch, you wish to view the hand decorated and assembled movement as much as possible. The movement itself reminds me a lot of what you see in the back of an Omega SpeedMaster Moonwatch. Do you agree? This limited edition line will start with a line of just 88 pieces. This is enough to judge if there is enough interest in the brand to move forward with more models. I can’t wait to see some actual images of this pretty handsome looking watch that does a good job of getting the “front mounted rotor” right. The mixture of gold, black, and red trim is very tasteful and utterly masculine. There will be a lot of interested people in Mr. Jouvenot’s watches. Their biggest rival right now in terms of functions and appearance is Perrelet, so we will see how the two compare. I look forward to seeing more soon. See Frederic Jouvenot and Perrelet watches on eBay here. The movement in this watch seems to be a new variant (or modification) of Sea-Gull’s ST-19 hand-wind chronograph movement. An automatic version of this movement has been rumored to be in development, but the addition of the rotor on the face of the watch is unexpected. In case you are not familiar, Sea-Gull is one of the world’s largest mechanical watch movement producers. There has been some controversy in the past as several of its movement lines have been finished in Europe and sold as Swiss. Thanks for the comment. I agree that Sea-Gull, and the Chinese overall are getting much better at movement making, but I don’t see any evidence that Jouvenot has copied a Chinese movement for this watch. I really would surprised if the two are at all related. Thanks and take care. The obvious issue (to me) is will the rotor obscure the subdials while holding the watch in any but the most precise position? Yes, that is true, and just part of the “uniqueness” of the design. Let’s just say that it is the best that could be done by having a traditionally laid out chronograph dial with an exposed front mounted rotor! If you need a chronograph function that often – you can either afford it if you can afford this watch or phone, or you can simply use the stop watch that is likely part of the phone software! lol. Talk to you soon.